The Great Library has been hosting a student from the Library and Information Technology program at Red River College for the past two weeks. Artemis Hedrich is in the final few months of the program, and this was an opportunity for her to see how a law library works. 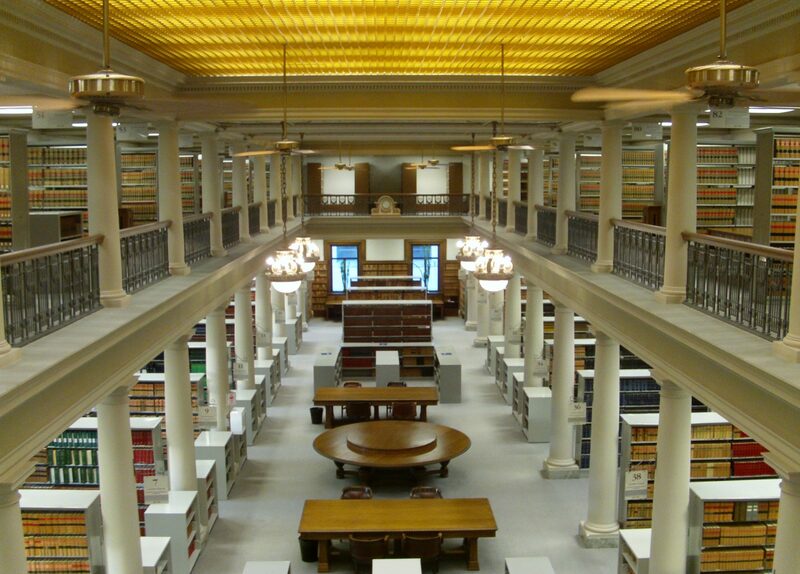 With help from legal information professional Allyssa McFadyen, she put together a display on the many resources of Manitoba law that are available both here at the Great Library and online. This collection of papers dedicates itself to the legacy of The Honourable Justice Marshall Rothstein, who became a judge of the Supreme Court of Canada in 2006 and retired in 2015. On November 1, 2018, amendments to the Personal Information Protection and Electronic Documents Act (PIPEDA) came into force which impose mandatory breach reporting, notification and record-keeping requirements on organizations subject to PIPEDA. This includes law firms. This webinar presentation is designed to provide practitioners who do not specialize in privacy law with a primer on the new PIPEDA requirements as well as an update on other cutting edge privacy law topics. Includes 1 hour of CPD activity, including 0.5 hours of EPPM. Includes 1 hour of CPD activity. The CPLED Program has been the Manitoba bar admission course for the past 15 years. It has been delivered through three provincial organizations, the Legal Education Society of Alberta, the Law Society of Saskatchewan-Bar Admission Office and the Law Society of Manitoba. While the past 15 years have successfully launched many law graduates into rewarding careers, it is a program that is due for a refresh to bring it in line with the changing nature of the profession and the practice of law. Technology, diversity, increased cultural and gender awareness and changes in the way legal services are delivered have called out for changes in how we bridge law graduates from being students to being professionals. As a result, CPLED hired a new CEO last spring and significant strides have been taken to redevelop our Bar Admission program into what we are calling CPLED 2.0. The student cannot start CPLED before September 2019 (e.g. still awaiting a Certificate of Qualification from the National Committee on Accreditation). The CEO of CPLED, Dr. Kara Mitchelmore, will be in Winnipeg during the first week of March and would like to meet with as many employers and principals as possible. Dr. Mitchelmore would like to share with the profession what changes will be forthcoming with CPLED 2.0 and what impact that might have on articling students and their relationships within their workplaces. Larger employers will be contacted directly to set up meetings with Dr. Mitchelmore. If you are a smaller workplace that routinely takes on articling students or if you anticipate taking on an articling student in 2020 or beyond, please contact Joan Holmstrom, the Director of Manitoba CPLED, at 204-926-2017 to attend one of the presentations given by Dr. Mitchelmore on March 4th or on March 8th, 2019. Experience as a mentor or principal. This will be an enriching experience for lawyers who have a passion for teaching and mentoring. We hope to hear from you.